Wanna play a game? SEA-FOOD! I'm sure that growing up, your parents at least attempted to teach you some table manners. They may have taken hold, or they may not. I've seen people in their 40's who have atrocious table manners. They chew with their mouths open, speak with their mouths full, burp in your face, and basically make meal time a little less pleasant for those around them. But, have you ever wondered where table manners came from? Believe it or not, we don't have an exact year for the origin of table manners. And that's because they originated back before there were things called tables. What we call table manners originated about 11,000 years ago or so. When humans were hunter/gatherers, groups would bring the days collection together and place it in a communal pile. Then, they grabbed what they could. If you were slow, you went hungry. If you wanted that meat, you grabbed it. You may have had to fight over it, too. If you didn't grab food and shove it in your mouth and go for more, you might not get enough to eat. As man became more of an agricultural society, and as herding became more common, suddenly food was not as scarce. Groups now had enough food every day to feed everyone, so there was no need for the chaotic grab. It was at this time that when table manners first started appearing. The first manners were most likely, 'Slow down, don't fight and share'. As time went on, table manners, (and manners in general), were refined. The first recorded instructions on how to behave at the table comes from Egypt. A papyrus detailing how a young Egyptian male should act when invited to dinner at a superiors table sits in a museum in Paris. Two thousand years later when the old testament was being written, Pathhoteps instructions had made the rounds of all the civilizations of the Mediterranean, and some of his ideas were included. Proverbs and Ecclesiastes feature large sections of his writings on the preparation and consumption of foods. While people today may not think table manners are all that important, they were to ancient civilizations. The Spartans, Romans and Indus civilizations all had some form of communal dining. And almost every civilization has held public banquets. And, back then, bad table manners could get you killed. 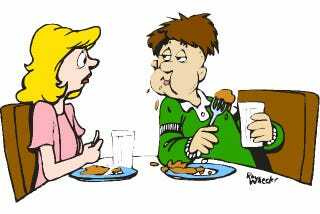 Talk to almost any expert on etiquette or even a commander in the military, and they will complain about the lack of basic table manners these days. A lot has to do with the decline of the family dinner. Families are less likely to sit down as a group for a nice dinner together. Everyone is in a hurry, so they eat and run when they can. They eat microwave meals alone. Military commanders were some of the first to notice the sharp decline. They get to see large groups of young people eating, and they say, it's not a pretty sight. In fact, they have started teaching table manners in basic training, the problem is so bad. So, when you eat, just take a minute to consider what annoys you about others when they eat. And then think about if you do any of those things. Now, if anyone is interested, maybe someday I'll tell you all about the origin of the fork and spoon.